It was a joy and privilege to share worship with Pr. Robert Wegehoft at St. Peter’s this morning. Pr. Bob preached for us, and we took the opportunity to celebrate this his 50th year of ordained service to God. If you could not be present, I am saddened that you missed a sermon that was inspiring, funny, charming, and faithful in many and various ways. And … you missed some amazing music offered by his friends and family at our late traditional service. We have been blessed for a number of years know to know the Wegehoft family, and to be uplifted by their spirits of joyful service to God. As I thought about Pr. Wegehoft’s ministry, my mind kept returning to the pastoral stole that we wears these days for every service he leads, no matter the season or festival. 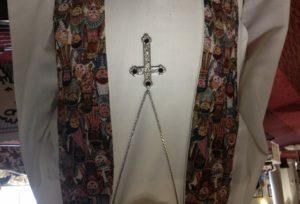 It is a stole that is covered with images of children, from all over the world. He absolutely loves it, and I can understand why. Because even in his 70+ years of age, the way he cherishes young people is obvious to all. He draws from a seemingly endless well of joy and love for these youngest Christians in our midst. And what I see in the eyes of his own children and grandchildren, proclaims to me the way this man has integrated his love of children into his life, his ministry, and his witness to others. And I am reminded … “I want to be like Pr. 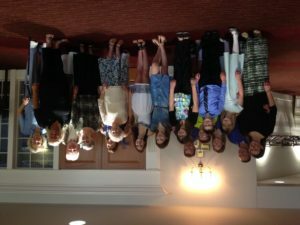 Bob.” I want to model that same faith to those children for whom I am a mentor. 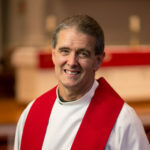 And I found myself thinking about other models of faith in my life … Pastor Richard Geib, our Pastor Emeritus, who when I first came to St. Peter’s as a student intern in 1981, was modeling a love and respect for teenagers in his ministry that I continue strive to embody in my own ministry. I think of another of our retired ministers at St. Peter’s, Pr. Jeffrey Pretz, and the magnificent witness to young children he lives and models both in his leadership and in his family, and again I find myself in the presence of a role model I honor and love. Who are your mentors in the faith, I wonder? Who helped you to walk into the light of Jesus and his love? Who modeled that love for you in their life with you? Who are the people who shaped you in ways that make you the Christian you are today? And how can you pass that torch of faith on to others this week?